By car: from Turin: take the motorway A55 Torino - Pinerolo and follow signs for Saluzzo. From Turin or Savona: take the motorway A6 Torino - Savona exit Marene and follow signs for Savigliano and then Saluzzo. From Cote d’Azur: via Colle di Tenda - Cuneo - Saluzzo. By train: use the Torino - Savona or Torino - Ventimiglia - Nizza. Get off at Savigliano and continue to Saluzzo by train, bus or taxi (reservable by the hotel). 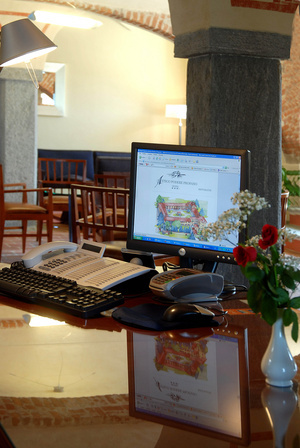 Possibility by telephoning the hotel, transportation from the station. By plane: from Turin airport, take the Turin ring-road, exit motorway A55 for Pinerolo and continue to Saluzzo. From Cuneo airport, take the SP 20 for Savigliano and continue to Saluzzo. Car rental and airport transfers reservable by the hotel.